New Book: You Are Now Less Dumb – Win shirts and signed books! You can preorder my new book right now. * You’ll learn about a scientist’s bizarre experiment that tested what would happen if multiple messiahs lived together for several years and how you can use what he learned to debunk your own delusions. * You’ll see how Bill Clinton, Gerard Butler, and Robert DeNiro are all equally ignorant in one very silly way that you can easily avoid. *You’ll learn why the same person’s accent can be irritating in some situations and charming in others and how that relates to poor hiring choices as well as avoidable mistakes in education. *You’ll finally understand why people wait in line to walk into unlocked rooms and how that same behavior slows national social change. *You’ll learn why people who die and come back tend to return with similar stories, and you’ll see how the explanation can help you avoid arguments on the Internet. You’ll discover the connection between salads, football, and consciousness. Email your receipt to david [at] youarenotsosmart.com (or send a screenshot). Thank you. Again. I mean it. I want to hug the torsos and/or vigorously shake the hands of all the people who love what gets posted here. You made the new book possible, and I can’t wait for you to read it. If you are one of those people, know that preordering a book is just about the most amazing thing you can do for an author. If I met you in person, and you bought me a cup of coffee and a cinnamon bun and then took me to see a man playing electric guitar solos inside a cage that protected him from bolts of lightning generated by a nearby Tesla coil, that still would not be as cool to me as you preording the new book (but it would still be very cool and please do that if we ever meet). Why is that? The publishing world uses preorders to determine what is worth putting in bookstores, where it goes, who is worth inviting to interviews, and probably lots of other things I don’t even know about. Another reason that I really hope you grab a copy is that I almost died writing this book – seriously. 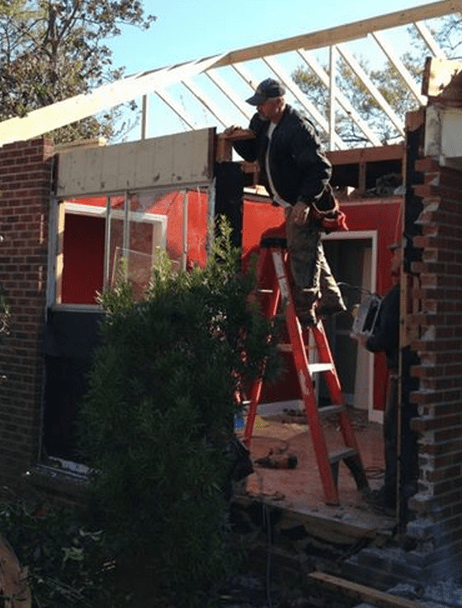 A tornado pushed a tree into the room where I was editing the day before I handed in the final draft to my publisher. I saved a copy of the manuscript to Dropbox, and about 10 minutes later I was on the floor of a hallway with my wife covered in blankets and pillows. I’m writing this from that same room with a new roof above me and a new wall behind me. That was just a weird twist of fate though. The real reason I hope you get this book is that I think you will love it and share it with others. “You Are Now Less Dumb” takes the ideas and themes of “You Are Not So Smart” and explores how self knowledge of self delusion can be used to become less dumb. It goes deeper than the first book, and the chapters are longer, the explorations more thoughtful – it’s simply a better book all around, and I loved writing it. Before I explain where the idea came from, I’d like to endorse the people who did the hardest work. If you need a video, please contact Plus3. They made the trailer above, and they are great to work with. You can visit their website at www.plus3video.com. It’s true. People educated and not so educated believed that geese grew on trees for at least 700 years. A certain type of barnacle often found floating on driftwood was thought to be a goose egg case because it kind of, sort of, looked like a goose that lived in the same area. 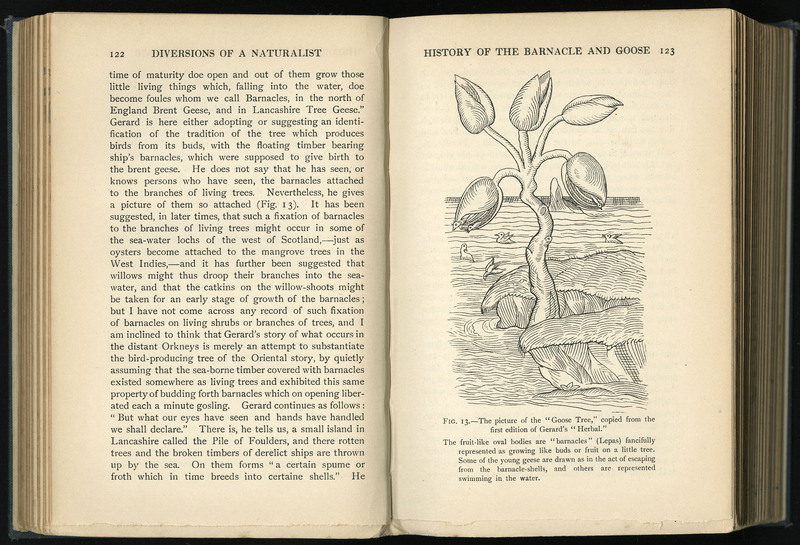 According to the naturalist Sir Ray Lankester, nature texts going back to the 1100s described trees with odd fruits from which geese would hatch, and there is evidence to suggest the belief goes back 2,000 years earlier. There was a particular breed of goose that lived along the marshes in Britain, and this goose migrated to breed and lay its eggs. The geese seemed to sometimes suddenly appear in large number in the same places where, while the geese were missing for long stretches, the barnacles tended to wash ashore. Wise, learned, monks explained to the people of the day that the barnacles were the geese in their early stages of development. Lankester wrote that the belief was further solidified by those same monks who also claimed you could eat a barnacle goose during Lent because, well, it wasn’t a bird. Apparently the belief was well-established and quite popular because in 1215 Pope Innocent III announced that, although everyone knew they grew on trees, the eating of barnacle geese was still strictly prohibited by the church, effectively closing the loophole created by those wily monks. The idea wasn’t difficult to accept to minds of that era because spontaneous generation was already an accepted truth yet to be torn apart by scientists using scientific methods. People still believed that rotting meat gave birth to flies all by itself and that piles of dirty rags could transform into mice and that most everything else came from slime or mud. A tree that sprouted bird buds seemed reasonable, especially if you after 500 years you had never once caught two of the adults mating. You don’t believe in goose trees today not because it’s a silly idea, but because scientists discovered evidence to the contrary and then passed that information around. The lesson here is that silly ideas don’t just go away because they are silly. You need a system to test them. Think about how you might apply those same principles in your own life – shopping, eating bagels, discussing politics, choosing a career, and so on. Remember, without an agreed-upon system for making sense of reality and a network of observers questioning each other’s data and methods, goose trees remained common knowledge for hundreds of years. Imagine what weird, untested things might be floating around in your aquarium of beliefs. I write about this in You Are Now Less Dumb because you should understand that your natural way of understanding the world is no better than the people who used to believe geese grew on trees. Just like them, you’re pretty terrible at being skeptical. Just like them, you prefer to confirm your beliefs instead of disconfirming them. It’s just the way brains work. You are less dumb because you were born after science became an institution and people had done science for long enough to falsify a lot of old myths. The scientific method is a tool human beings use to prevent themselves from doing what comes naturally. Without it, you prefer to explain what you observe in reverse: you start with a conclusion and use motivated reasoning to defend an assumption formed through the lens of confirmation bias while committing the post hoc fallacy as you argue for your an explanation couched in narrative supported by hindsight bias and a mixed bag of other self delusions. Science forces you to see your conclusions as what they usually are – hypotheses. It then makes a zillion other hypotheses and starts smashing them all to pieces with data. Eventually, the hypotheses that survive are more likely than the ones that perish. It’s a method you should borrow. Try it sometime, and after you’ve subjected your own hypotheses to abuse notice how that forces you to draw new conclusions about this strange, beautiful, complicated experience of being a person. Heron-Allen, E. (1928). 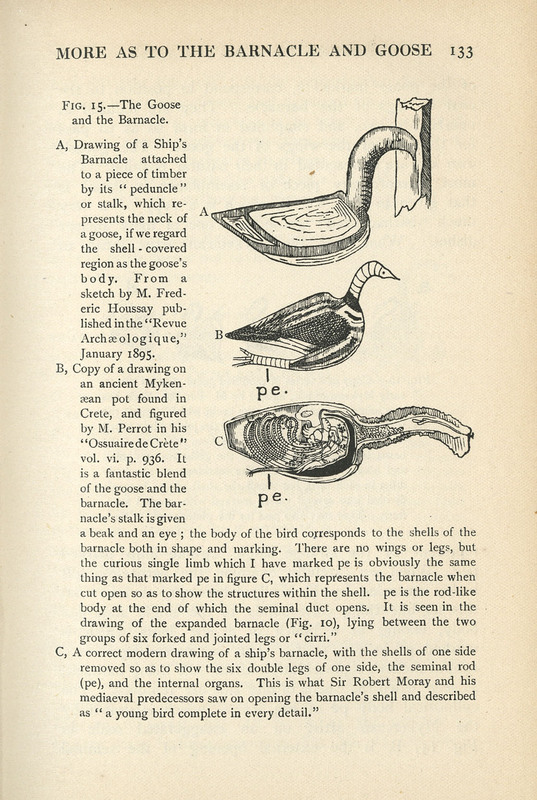 Barnacles in Nature and in Myth 1928.